Jonas Olsons bok Moral Error Theory – History, Critique, Defence, är den första boken helt ägnad åt errorteorier inom metaetik. Boken ges ut av Oxford University Press och publiceras i dagarna. 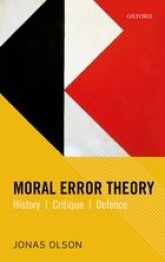 Jonas Olson presents a critical survey of moral error theory, the view that there are no moral facts and so all moral claims are false. In Part I (History), he explores the historical context of the debate, and discusses the moral error theories of David Hume and of some more or less influential twentieth century philosophers, including Axel Hägerström, Bertrand Russell, Ludwig Wittgenstein, and Richard Robinson. He argues that the early cases for moral error theory are suggestive but that they would have been stronger had they included something like J. L. Mackie's arguments that moral properties and facts are metaphysically queer. Part II (Critique) focuses on these arguments. Olson identifies four queerness arguments, concerning supervenience, knowledge, motivation, and irreducible normativity, and goes on to establish that while the first three are not compelling, the fourth has considerable force, especially when combined with debunking explanations of why we tend to believe that there are moral properties and facts when in fact there are none. One conclusion of Part II is that a plausible error theory takes the form of an error theory about irreducible normativity. In Part III (Defence), Olson considers challenges according to which that kind of error theory has problematic ramifications regarding hypothetical reasons, epistemic reasons, and deliberation. He ends his discussion with a consideration of the implications of moral error theory for ordinary moral thought and talk, and for normative theorizing. Jonas Olson är forskare inom praktisk filosofi på filosofiska institutionen vid Stockholms universitet.